I have a block that shows some data from the User area (People) in Drupal 7. I have a rewrite setup that shows "VACANT" if there is no user selected for the content type. When logged in, I see users for 3 of the 4 contents I have created, which is correct. When logged out, I see VACANT for all of the contents. Is there some restrictions on showing User data to the public? How can I make a certain Role visible to everyone? EDIT::: Thanks to @Clive: View user profiles [x] for anonymous. Not the answer you're looking for? Browse other questions tagged 7 blocks users or ask your own question. How to show only user assigned contents in his dashboard? 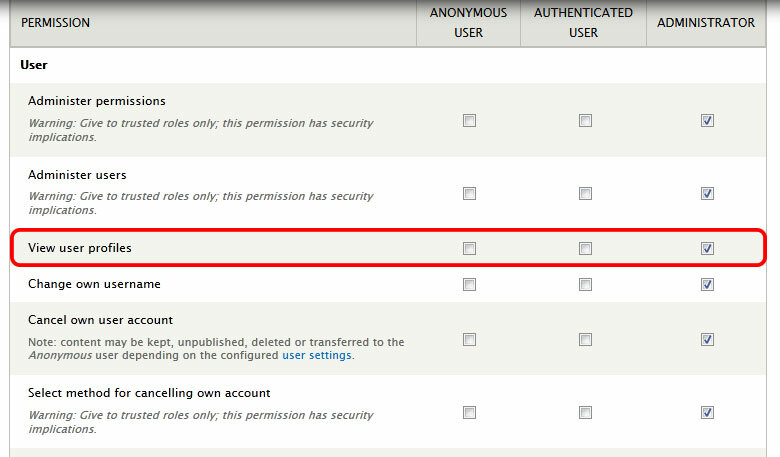 How can I let anonymous users view user profiles by role? What is the equivalent of hook_user_view()?